Is This: A Recovery? Or As Good As It Gets? On Thursday, FGI hosted a retail symposium at the New York Hilton for cocktails, lunch and a panel discussion on the nation’s economic outlook and its effect on the apparel and retail industries. 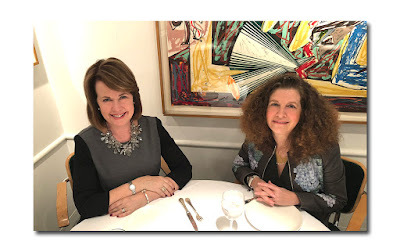 This is the first in an ongoing series developed by The Robin Report and Fashion Group International, during which industry leaders participated in a panel discussion moderated by Robin Lewis, CEO and Managing Editor, of The Robin Report. Opening Comments on the economy were by Andrew Tilton, Senior Economist Goldman Sachs and results of a special consumer survey conducted by John Long, Partner and Retail Strategist, Kurt Salmon Associates. A panel discussion followed, lead by Robin Lewis with the participation of industry leaders: Neil Cole, CEO, Iconix Brand Group Inc; Joseph Gromek, CEO, Warnaco Group Inc.; and Alexis Maybank, CMO & Founder, Gilt Groupe. Opening comments from economist Andrew R. Tilton, not only set the stage for today’s trying economic times, but also compared this recession and its rate of recovery to prior recessions that occurred over the last 10 to 15 years. Current activity indicates average GDP growth of 0-2½% while in prior recessions; GDP averaged 2½ - 3½%. Recovery has yet to sustain above-trend growth. 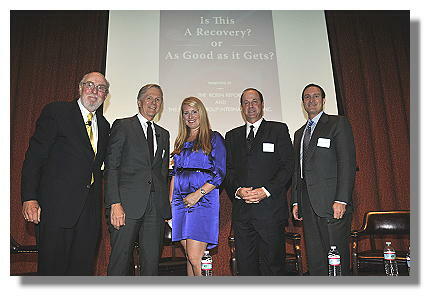 Tilton believes that there are three reasons for the slow down of this recovery. Cyclical sectors, such as housing and auto sales, are well below long term norms, however, housing is still well below demographic trend in housing starts and demand for homes. At present, ½ million homes are being constructed each year, but population is growing by one million per year. Over time, there needs to be a substantial increase in housing to keep up with future demand. At the same time, auto sales are still at historical lows, but production is up. Tilton sees signs of encouragement at the consumer level with households’ indebtedness dropping sharply, less onerous, putting households on a path to a good place financially. Tilton’s forecast is for continued low GDP growth in 2012, predicting 2-2 1/2% next year. Unemployment stays high, with need more geographic. Tilton also contends that inflation is not a problem. The main risk to the U.S. economy remains Europe. He does not see a repeat of 2008, as there is an availability of credit. John Long, Partner and Retail Strategist, at Kurt Salmon Associates, focused on the two sides of the consumer perspective, the high income household versus the low income consumer and their anticipated spending patterns for holiday and beyond. Kurt Salmon polled over 8,000 consumers and found that they would spend slightly more on back to school, especially on electronics and back packs. These numbers return to pre-recession back to school spending. In the past, back to school spending has been predictive of holiday sales. Despite better than expected b-t-s sales, all income levels, including $150,000 and up have said they will spend less for holiday. However, while consumers are telling pollsters one thing – that they will spend less - they are, in actuality, spending more. Despite the steep drop in consumer confidence, Long finds that consumers still use retail as an escape, and as therapy. Kurt Salmon polled over 100 retail executives regarding future sales and 60% expect holiday sales to increase, with continued growth over the next five years due to online sales, viewing their on-line channel of distribution, as the one with most growth. At the same time single businesses plan to remodel stores, enhance online presentation and build new stores. What to expect in 2012? Retailers are focused on their core customers, how they will spend, what they can do to get customers to spend more and how to enhance the shopping experience, both online and in-store. At the same time, retail managers are aggressively managing costs, rewarding teams at being for efficiency. Where are retailers and manufacturers planning for growth over the next 5 years? Retailers are focusing on expanding to emerging marketplaces China, Brazil and the Middle East. They are innovating, looking for new retail concepts, targeting new customers via social media and focusing on mobile commerce. One in ten on-line retail sales comes from a mobile device. If you’re not equipped to handle mobile retail sales, you can’t make it in the future retail environment. Joe Gromck, CEO Warnaco: Warnaco is a two and a half billion dollar company. Sixty percent of their sales are outside of the U. S. They see growth potential in expanding their own retail stores, currently 100 million dollars from just 2 stores. Calvin Klein is important segment of their business. Warnaco CEO, Joe Gromek: Believes that this new low of GDP is the new norm. The first half of the year was strong, so far the second half less so. Housing, dysfunctional government, and high energy prices are squeezing low end value consumers. Middle income shopper is trading down and the high end customer looks at the stock market dropping along with their wealth. These are the failures compounding the current situation. He sees growth for Warnaco in Europe, which is currently under served, Asia and South America. The Gilt Groupe CM0 and founder, Alexis Maybank: Their customer is in their 20’30s, wants greater value, quality. They value fashion, spending not as determined by lack of disposable income. Due to recession, Maybank finds that they are keeping product longer, trading with friends. Consumer wants product to stand for something – civic responsibility of customer. Customer is directly affected by recession and difficulty with job search coming out of college. Neil Cole: Iconix Their business is casual attire, licensing brands. Sell all retail segments, broken out by sector.“Three years ago, I formed my perspective suppliers.”Sees long, slow recovery. Higher commodity prices, bumps in the road. Economy now a world economy. The hiccup is Europe and its financial woes. “The consumer has been remarkable in the last 2 years.” He sees consumer as incredibly resilient. Most are suffering due to gas and housing. Iconix gives great brands to both wholesalers and retailers. They have great partners in acquiring great brands. 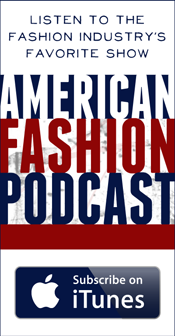 What advice to Fashion Group and industry at large? How to grow through this economy? Joe Gromek: Focus on brands, and incredible product. “Creating the want”. It’s not just about price. Alexis Maybank: The Gilt Group has had growth even in the recession. Less overhead in their business, need fewer people to sell the product. They can pass that savings along to their customer. More flexibility with product. Fast pace of sales, items can sell out within an hour. Constantly introducing freshness at a fast rate. Can service customer faster. Respond to trends faster and greater flexibility in their margins. Q White space, expanding next, inflationary pricing on retail. Is that a factor affecting the consumer? Neil Cole: Doesn’t think so. Have exciting product. Give consumer great stuff. The rise in cotton and gas prices is bump in the road. Joe Gromek: For commodities, consumer shop price to death for example, Calvin Klein 3 pack underwear, for Calvin Klein fashion product the consumer may have to pay ten percent more. Be true to who you are as a brand. Price will be less of an issue. Alexis Maybank: Pricing trends for The Gilt Groupe are tied to retail. The key difference, they can move through inventory in 36 hours or even one hour. Product is priced as “insider pricing” More inventory available for fall as retailers bought more. Model is real time from inventory standpoint. Joe Gromek: Retailers are controlling inventory. Q There is new business like Groupon and other new big deals. Is this pricing index aggregate? Is this not leading to a deflationary effect? Neil Cole: If the customer has $100 to spend, he may buy one shirt, not four. Customer is affected by gas prices, etc. but looks to value when purchasing. Joe Gromek: Look at it geographically. The U.S. Europe, Latin America the Far East - price inventory by geographic area. They are more aggressive in pricing in developing areas. Alexis Maybank: The Gilt Group is not a liquidation platform. They are offering exclusive, limited, exciting merchandise in a unique shopping environment. They are an easy place for customers to shop, they offer information, “how to”, with a purchase. They provide “editorial” information on what the product stands for, which drives customer to buy every day. Q Pricing affecting multi-brand department stores. Customer can look on line to find the product cheaper. How to remedy that? Joe Gromek: Warnaco does suggested retail pricing. Neil Cole: Iconix’s business model – exclusive branding for retailers. 80% of their product unique. They offer exciting brands, good value. There’s less competition in their business model (licensed product). There’s demand for their brands, which are more than half their business. Q Social media an issue? Alexis Maybank: Social media is an opportunity, not an issue. The website is the new flagship. It is responsive to both negative and positive feedback. When using social media, the firm needs to respond immediately. Social media humanizes brands. You are connecting with consumer. Newest is Mobile commerce. It allows product and service at any time of day on his or her turf. You go to customer at all levels at all time periods. Product has to be available whenever the customer wants it. One in 10 shopping transactions online is through a mobile device. Joe Gromek: In the past Calvin Klein spent between $60 – $70 million on marketing, most of which was print. They are making a significant move to social media. Warnaco is using social median in Hong Kong train stations." Neil Cole: Iconix checks in with over 1,000 consumers and interacts with them before they go to market with product, for a two or three week period, through their marketing companies. Sees bloggers as the new critics, gaining favor with consumer is important. Q How do you overlap with retailers like Kohl’s and their interaction with consumers? Neil Cole: Iconix supplies celebrities for product. Celebrities tweet about product and selling. There are celebrity cults. Q You hear a lot about localization? Alexis Maybank: The Gilt Group gives business calls to members regarding restaurants, stores, connecting them with partners,through localization. Joe Gromek: Macy’s is doing a very good job with localizing merchandise, 10 to 15% of product. Kohl’s segments by attribute, geography or climate. Q How does it affect Calvin Klein? Joe Gromek: Each retailer wants different merchandise. We create a brand for them. While Chaps isn’t totally exclusive to Kohl’s, it’s an example. Neil Cole: Taking brands around the world, changes product a bit, for example in the London Fog raincoats made for China, there are more pockets than in the same U. S. product, as the Chinese like more pockets. Q What are the three most important things to open a business? Joe Gromek: Brand, product, make it innovative, like Apple. Alexis Maybank: Inspire the consumer with fresh, new and changing product. Q Which of their product will sell for holiday? Q What product will lead for holiday selling? Electronics, yet apparel will be strong. Q What are you spending on marketing for 2012? Alexis Maybank : Social media, for more insight. Beautifully shown product and presentation. Availability – 75% of inventory sells in first 90 minutes. Show customer the intrinsic quality of product. Q Is this the end of fast fashion? Alexis Maybank: It’s here to stay, but with a change in meaning. Shorter lead time to customer reaction to purchase. Now 2 week lead time. Gilt Groupe can react to trends and prices. They can find capsule collection at the Gilt Groupe. Q What about the consumer experience with traditional retailers? Joe Gromek: It’s incredibly important. They demand great product, service. In Hong Kong, CK Jeans is #1 in China. Alexis Maybank: Not an issue of need but want. When she started the company with co-founder, Alexandra Wilkis Wilson, they invested in photography and elevated how the product would be shown. It’s all shot on models. They show models with appropriate makeup and hair and accessories, inspiring the customer. You want the customer to see themselves in your product. Neil Cole: If you don’t do it right, there are 10 other companies who want your spot. Q Will Amazon surpass brick and mortar store selling? A There was a yes and a maybe answer. Tricia Kenney is an independent fashion editor, writer and marketer whose work has appeared in national consumer and trade publications. For ten years she was a creative director at Creative Marketing Plus, where she won two Communicator Awards. She has been a fashion editor at Glamour Magazine and a Fashion Director at Macy’s. A native New Yorker, Kenney is a frequent commentator on fashion, lifestyle and culture.